This is honestly the first non-Studio Ghibli, non-video-game-related anime movie I’ve ever really sat down to watch with the intention of actually watching the thing all the way through to the end. My friend who had suggested K-PAX a while ago had originally suggested the original Macross movie (actually a TV program edited into a movie which is more accurately named The Super Dimension Fortress Macross, but… well, we’ll just stick to Macross for this review), but, upon browsing Netflix, it looked like all they carried was the series version that spanned 8 discs – and there was no way I was going to watch all that. Hence, the coaxing of his left field suggestion of K-PAX. But, lucky for me, my friend had figured out that, yes, there is actually a Macross movie I could review, and he just so happened to own it: Macross II: The Movie (a.k.a. 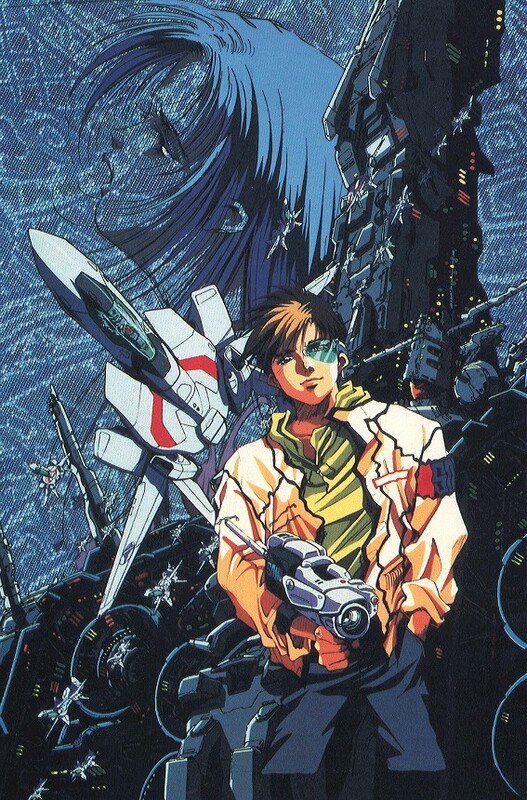 : The Super Dimension Fortress Macross II: Lovers Again, though, again, we’ll just shorten it to Macross II). I received only a minimalistic amount of introduction to the series from my friend before actually watching this, so if you happen to be a fan, please bear with me in this review. I imagine that my experience with the movie was a lot like being introduced to Star Trek for the first time by someone handing you a copy of The Search for Spock and getting just a minor background on Starfleet, who the characters are, and a quick synopsis of what happened in the previous entry that led up to the one you’re about to watch. 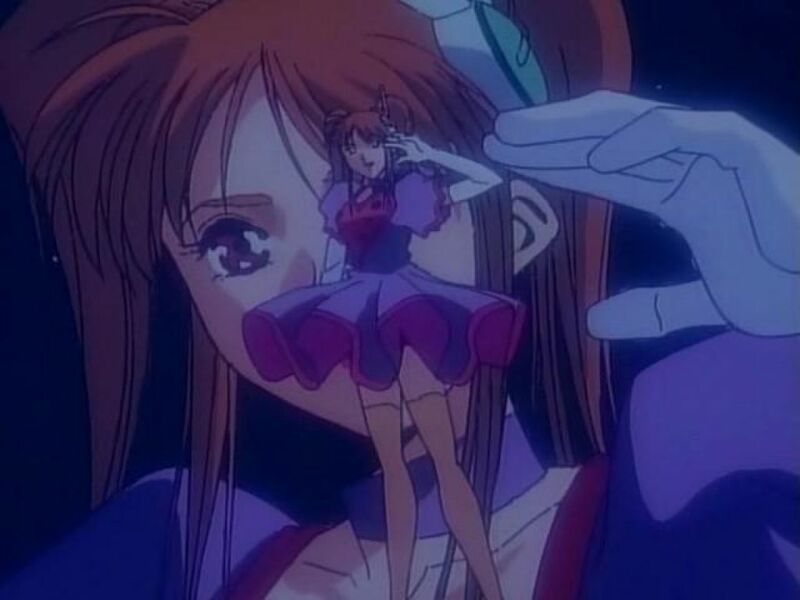 My only familiarity with Macross was that it existed. 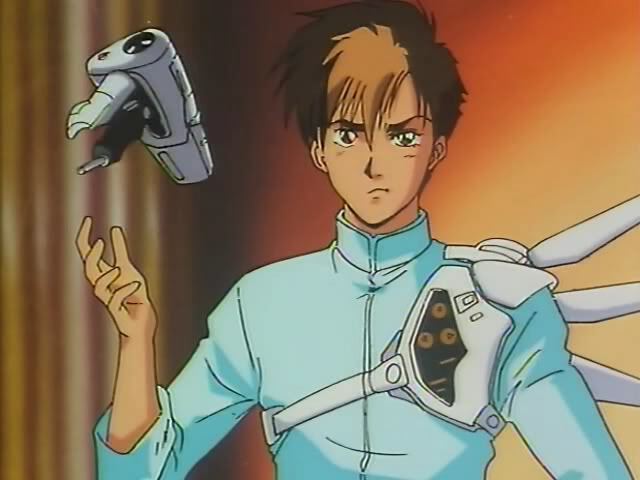 Heck, I didn’t even know that Robotech, whose name I was familiar with thanks to video games, was a pastiche of the original and two other series, thanks to wonky rights issues. Macross II is one of those parallel universe sequels that is set quite some time after the original – so much so that the original characters are no longer alive, thus necessitating the creation of new characters (and also possibly allowing the production studio to take a few more liberties with the series without the ire of diehard fans, since it was produced without input from the original creators and studio). It’s the year 2092, years after the conflict between humans and an alien race known as the Zentradi and Meltlandi (male and female of the same giant alien race) has ended. 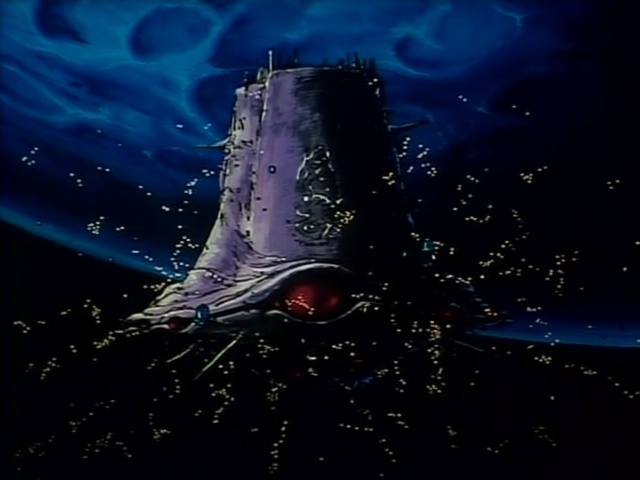 A ship known as the SDF-1 Macross rests in the middle of a city after crashing down to Earth (with a history that seems to vary between the movie and TV versions, though I presume this movie follows the previous movie, where it was a human ship, damaged in battle, and abandoned). Our male hero is Hibiki Kanzaki, an eager but reckless reporter whose definition of success is based more on entertainment value and ratings numbers than accuracy and importance. As the film opens, his latest breaking news is the discovery that hotshot pilots Sylvie Gena and Exxegren Giri are an item and are spending some time together at a fancy hotel. Oddly enough, despite the ratings, his mentor, Dennis, and his boss don’t take too kindly to his tabloid bent and order him to apologize. 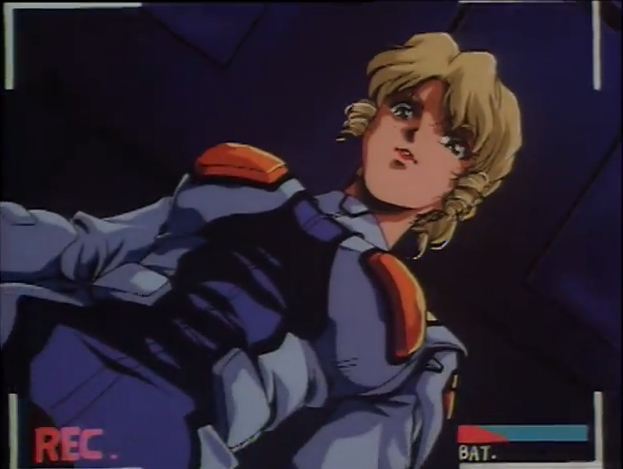 Before he has a chance to reconcile, however, the SDF-1 sends a burst of energy into space, and all pilots are called into action as an armada of hostile Zentradi are approaching. With Sylvie called into combat, Hibiki sees his opportunity to reconcile his ambitions with that of his boss and mentor and flies off to cover the ensuing battle. Let me hit pause here for a moment to discuss one of the more intriguing elements of the movie, which is its message regarding the media’s responsibility in communicating information and how it can be manipulated to influence ideas and actions in the people who consume it – everything from the news to pop stars are used to illustrate the idea that anything can become a means of one person, organization, or government controlling the minds of others. Throughout the course of the film, Hibiki is documenting every moment, and as the story unfolds, his integrity as a reporter begins to grow, even if his childish demeanor remains. We are shown how the human governments put on airshows that feature popular musicians performing their hit singles and how quickly and easily the stars’ adoring fans are to reconcile their affections for the celebrities with that of the government that is clearly trying to justify a new war. Hibiki and Dennis discover one of the Emulators after crashing into a Marduk ship, but Dennis is mortally wounded in the process and makes Hibiki swear to get the battle footage of the humans’ loss out to the public himself, knowing that their government would manipulate the footage to make it look like the humans were winning. Hibiki takes the girl home and documents his time with the timid girl, who reveals her name to be Ishtar (obviously named after the Babylonian goddess of both love and war). Ishtar and Hibiki bond with one another, with Hibiki introducing her to life on Earth, but she’s drawn primarily to the several variations of music it has to offer. Having only known music to be a means to a victory and the destruction of Marduk enemies, she’s even more intrigued by the concept of the “love song” and how such a thing could possibly lead to the end of her race’s obsession with annihilation. Without giving too much away (though you could probably figure out how it’s all resolved in the end if you tried), despite the movie’s often unintentionally humorous earnestness (something I’ve always felt was inherent to anime as a whole), the concepts that went into making this universe are admittedly quite imaginative and its means of delivering its message is pretty clever. I liked the paralleling between human and Marduk culture and how, despite the fact that they were on opposing sides, they were both using media (primarily music) as a form of influence and control. That dichotomy is itself paralleled by another dichotomy, with Hibiki and Ishtar both learning the importance and responsibility that comes with their roles in their respective cultures and figuring out that they can still pursue their passions without sacrificing their integrity and morals. Perhaps it had something to do with the film actually being made up of multiple episodes of a series, but, tonal issues aside, my biggest gripes with the film was the lack of time spent with Syvlie and her fleet of female pilots, the Faerie Squadron. For the most part, Syvlie spends the film as a passionless stoic who is intensely dedicated to her job. Rumors of her affair with fellow pilot Exxegren are the only signs of her repressed personality, and it’s intriguing to see her when she thinks she’s at the end of her rope with nothing to lose. And while I was surprised at how much I admired about the series, there were moments in watching the film where I was also quite bored enough to almost give up (being well over 2 hours long), so I’m still not exactly a Macross convert just yet, despite my friend’s hopes to the contrary. Also, I know that the film’s budget was that of a TV series (thus a lot of static backgrounds and economical use of panning stills), but I couldn’t help but feel as though the art direction was, at times, just a bit sloppy and inconsistent with its line work (though apparent special attention was given to female characters…), and the characters of Hibiki and Ishtar, both in terms of personality and design, were rather generic – the eager, hyperactive spiky-haired boy with big dreams and the shy, timid pixie girl who can’t help but find so much to love about everything. At least their journeys were interesting. 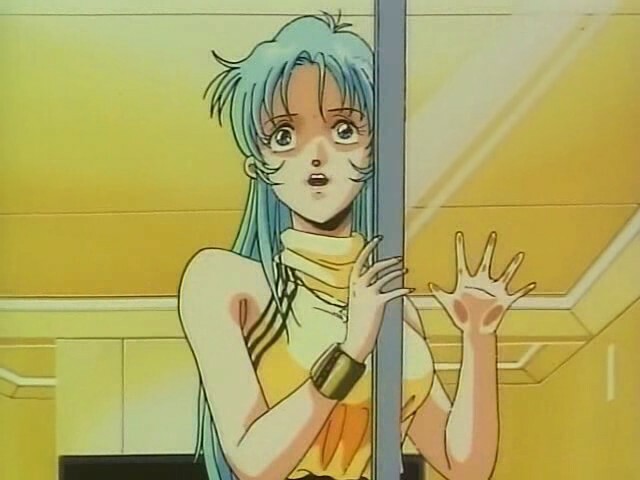 So, yes, overall, I was surprised at how much I managed to enjoy Macross II, despite my preconceived notions toward the film and its ilk in general. I was admittedly more intrigued by the film’s ideas, more so than its characters, however, and, for me, that’s a big knock against the film – Why go on a journey if you don’t care too much for your companions, you know? Once again, I’m thankful that I was finally pushed by a friend to go outside my normal viewing habits and watch something I never would have chosen otherwise, and I’m certainly glad that I was able to get some entertainment value out of it, too. I may not be compelled at this time to go any further into the depths of this series in particular, but, at the very least, it was a reminder that I really shouldn’t write something off just based on its medium. Finally! A Macross II Movie review!!!! LOVE THIS SERIES!! !